"The story goes like this: (Circa 1995) There was a guy named Joe Sib who used to sing in a band called, WAX on Interscope Records (They were the band with the video of the guy running down the street on fire.) He started his own label to put out 7âs of his friendâs bands. It was called, SideOne Records. His roommate at the time was Bill Armstrong, former axeman of the band Green Thumb, who was also starting his own label Dummy Records and was gearing up to release full length records. After not much thought at all, they pooled their life savings and joined forces. Why chage the name? Combine the two! 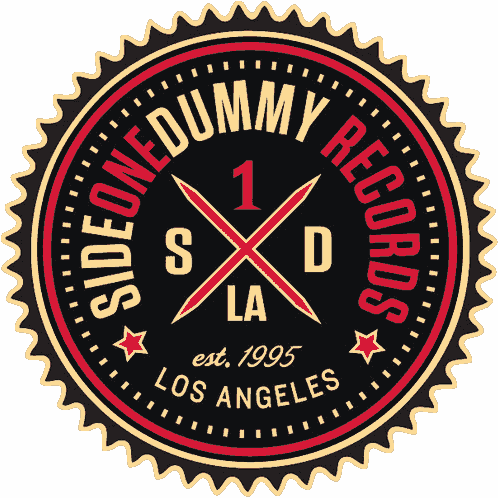 So, there it was, SideOneDummy. Their first release was a Swinginâ Utters collection CD. Joe & Bill own and run the company to this day!"